For over 200 years Catholics have been pastorally served in what is now known as the Southwest quadrant of Washington, DC. For over 150 years, and from the foundation of St. Dominic Church, the faithful of this area, and many others, have been spiritually enriched through ministry and preaching of the Dominican friars. The true history of the parish involves all the ways that the risen Christ has worked interiorly in and through His people. This is not always easy to record and remember, however. Below are some more externally significant moments in our history. 1806 - St. Mary's, the "Barry Chapel," is erected as a mission to serve the Catholic in what is now Southwest Washington DC. 1852 - The parish of St. Dominic is established under the care of the Order of Preachers, popularly known as the "Dominicans." March 19, 1854 - The first parish church is dedicated on the feast of St. Joseph, patron of the province of Dominicans serving St. Dominic's parish. November 19, 1865 - Just months after the conclusion of the Civil War (1861–65), the cornerstone of the present church is laid. June 13, 1875 - Designed by the now famous architect, Patrick Keely, a new and larger English Gothic church is dedicated, built to serve an increasing number of parishioners. March 12, 1885 - A fire destroys the entire interior of the church. Catholic and Protestants alike raise funds to restore the church, crafting a new interior said to be more beautiful than the original. 1887 - The Hilborne Roosevelt Organ, one of the few surviving organs made by the cousins of President Theodore Roosevelt, is installed in the parish. Its sound quality remains largely unchanged since its installation. March, 1889 - The large bronze bell, which is still heard today, is installed in the bell tower. 1905 - The Dominican House of Studies, the seminary for the Dominican Friars of the Province of St. Joseph (the "Eastern Province") moves to Washington. Soon after, the annual ordinations of priests began to take place at St. Dominic Church. 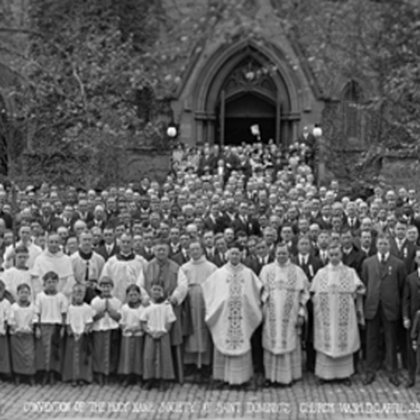 October 12, 1919 - The church is consecrated. Different than the dedicated church, a consecrated church can never be used for anything but divine worship. 1954 - Much of Southwest Washington is demolished and rebuilt in accord with the Redevelopment Act. The convent, school, and original priory, located where the expressway and Frontage Road is currently, are subsequently demolished -- over a period of time. It takes an act of Congress to protect and save the church. 1965 - The church's new stained glass windows, designed by the internationally renowned Edward Heimer family, are installed. 1977 - At the opening of the L'Enfant Plaza Metro Station, St. Dominic Church becomes the first Catholic church in Washington to be located at a metro stop. It has continued to serve many who work in the surrounding federal buildings to this day. October 7, 2012 - A new main altar is dedicated. The altar is surrounded by statues of Dominican saints and wood carvings related to the Eucharist. Within the altar are relics of St. Dominic, St. John Vianney, and St. Elizabeth Ann Seton. May 2013 - A new reredos is installed in the church as a beautiful seat for the newly installed tabernacle. The tabernacle dates from the 1870's and was acquired from Belgium. It also houses a relic of the true cross. October 1, 2015 - St. Dominic's Young Adult group officially begins. October 28, 2016 - A newly renovated St. Jude Shrine is blessed in the context of a solemn evening Mass on the Feast of St. Jude. March 1, 2017 - New Confessionals begin being used on Ash Wednesday, after having been blessed the Sunday before. March 7, 2017 - St. Dominic Cenacle officially begins. February 6, 2018 - St. Martin de Porres Shrine in honor of Fr. Norman Haddad is blessed.